The gamblers, who were arrested by police, seen in Kharupetia PS. The Darrang Police, after going on the rampage in recent times against illegal practices of gambling, ‘teer’ in the district, has made yet another significant breakthrough in its efforts when sleuths of Kharupetia Police Station were able to bust a racket of illegal gambling and ‘teer’ in Kharupetia. 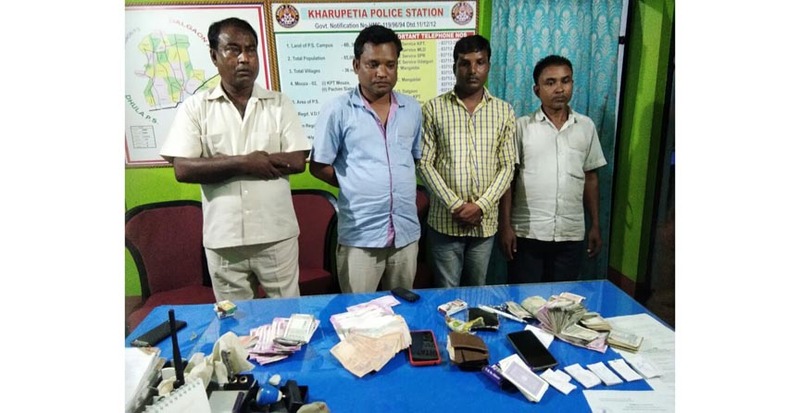 During the operation, led by newly-appointed Deputy Superintendent of Police (HQ), Amit Kr Hojai, the police team caught four gamblers and ‘teer’ agents red-handed. They were later arrested by Kharupetia Police. The police team also seized a cash amount of Rs 2.38,630, packets of playing cards, ‘teer’ tickets and a car bearing registration No AS 13 G 0397 from the possession of the gamblers, Darrang Superintendent of Police Sreejith T. told Northeast Now on Wednesday. The four persons, who have been booked under Assam Gambling and Betting Act, has been identified by police as Ejar Ali of Sherpur, Omar Ali and Abdul Ali of Dhula and Mozammil Hoque of Kharupetia. It may be mentioned here that as part of the drive against illegal practices, which have turned out to be social menaces in the district, the Darrang Police in the last couple of weeks has been able to bust similar two rackets in Mangldai and Sipajhar respectively. The Darrang Police has arrested fourteen illegal gamblers including a senior government veterinary official and owner of a brick klin. Moreover, altogether a total of cash amount around Rs 1.53 lakh has also been seized from the possession of the arrested gamblers. The Darrang Superintendent of Police has promised before this correspondent to continue their drive against smuggling and ‘teer’ during the ensuing festival season.